My name is Sophia Dhupar and this year, my family and I went to visit Rio de Janeiro, Brazil. Last year (2017), we traveled to India and I donated more than 300 pounds of school supplies to two schools in New Delhi. I wanted to donate school supplies to schools in need this year as well. So, at the end of my 5th grade school year, I asked my peers to donate whatever gently used school supplies they could spare. My peers donated more than 350 pounds!! 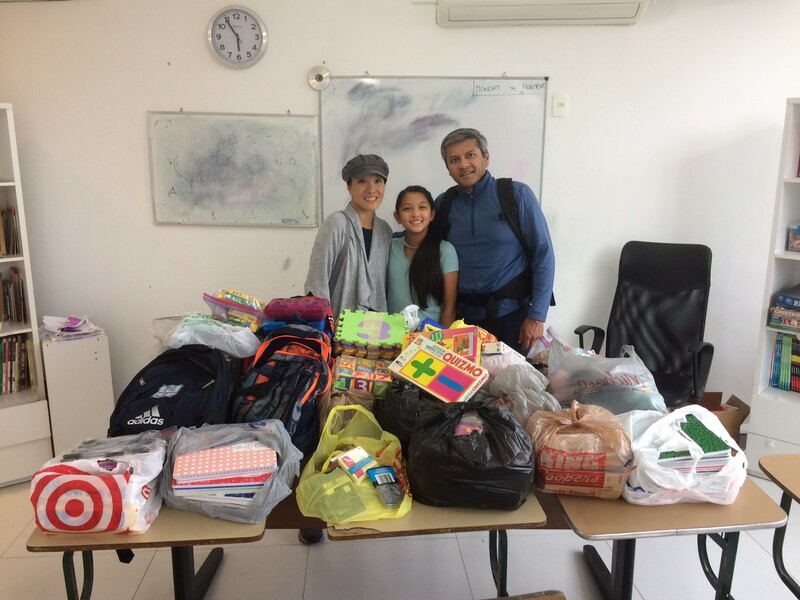 So, my family and I traveled to Rio de Janeiro in November with 7 suitcases full of notebooks, pencils, crayons, backpacks, and much more. 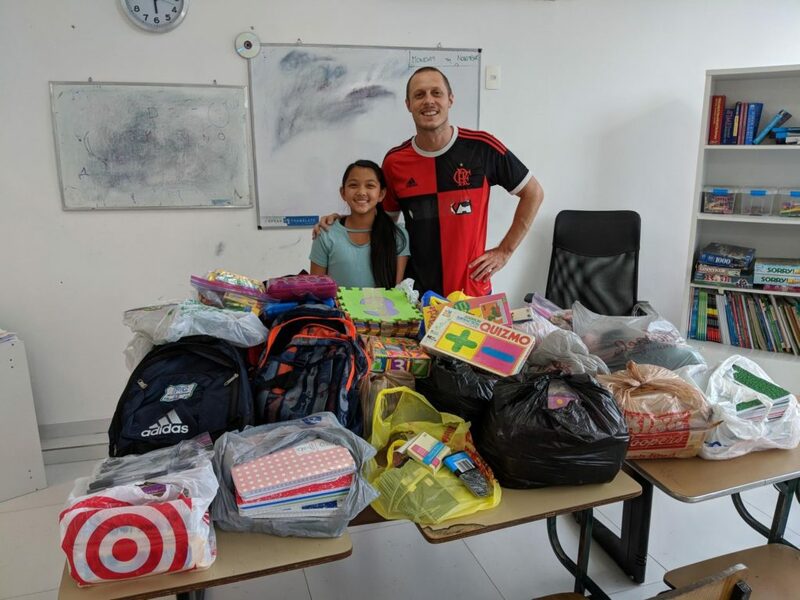 The supplies would be going to the Mais Caminhos program supported by the Caminhos Language Centre, as well as a school supported by Favela Phoenix tours. I had such a great time in Rio de Janeiro. It was an unforgettable trip. It felt so good to deliver the school supplies to the children and it was also a bonus just knowing that I was making someone else’s life better. I got to meet many of the children that I donated to and they were so sweet. They were so happy to get all the school supplies and excited to use it all. 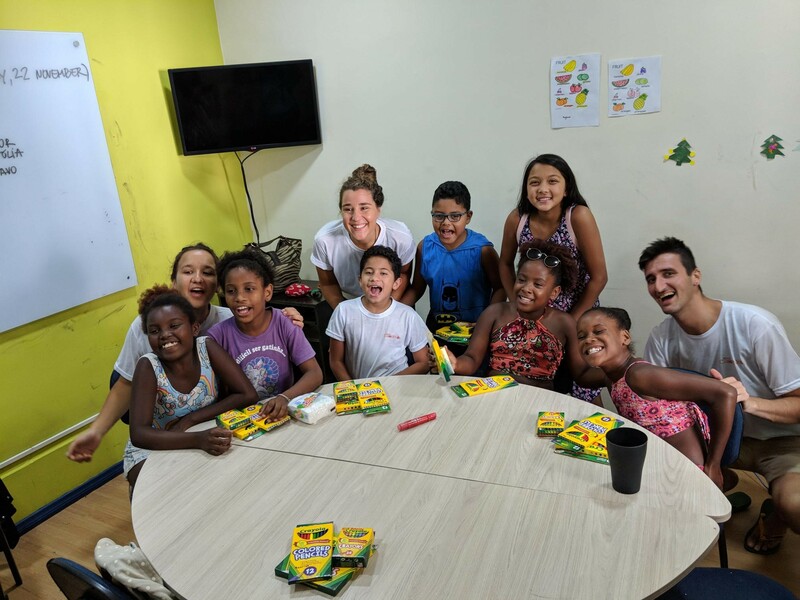 I got to visit two schools in Brazil this year. One of the schools was located in a favela Rocinha (Rio’s largest indigent housing community) high up in the city. It was actually difficult to get to the school since it was at the peak of a tall hill upon which the favela was located. We had to ride up very steep roads with a big truck and it was a bit scary, but it was worth it. Most of the gently used school supplies would have been thrown away. There are kids in parts of the world that don’t get new supplies every year and would just be so happy to get even a pack of used pencils or a used notebook. I started doing this to decrease the waste in my community and help other communities. I have gotten so much joy and happiness out of doing this project. I loved working with Pack for a Purpose and I hope to work with them for many more years to come.